On July 23, the Washington DC Harbor Fire Department and Project Enduring Pride hosted a barbecue for our wounded warriors and their families. Part of the day, the Fire Department demonstrated their capabilities to our families. A gorgeous day, good company, and a cruise on the Potomac. Thank-you, DC Fire Department! 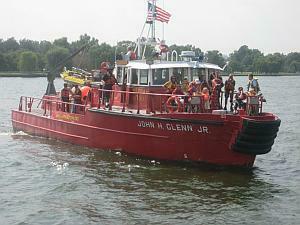 The John H. Glenn, Jr, coming into dock. Beautiful day for a demonstration.